The root canal treatment is done when the pulp of the tooth becomes infected or damaged. 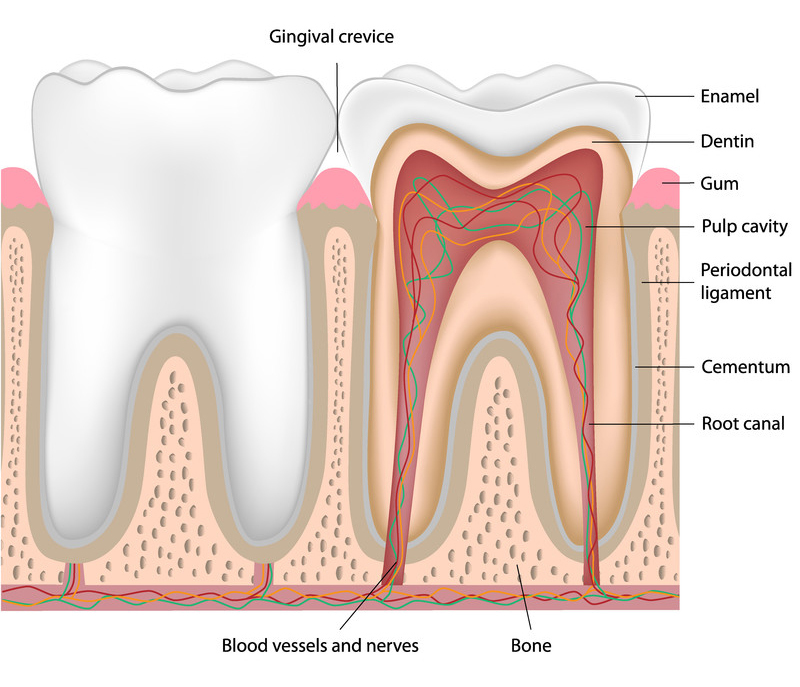 The pulp is the soft tissue that is found in the center of the tooth. It contains blood vessels, nerves and connective tissues. During the root canal treatment, the pulp and the nerves are removed to prevent bacteria from forming in the pulp chamber. The pulp can become infected due to a variety of reasons, including a crack or chip in the tooth, deep decay that is caused by bacteria, and even having multiple dental procedures on the tooth. Some signs of pulp damage include sensitivity to heat or cold, prolong tooth pain, swelling and tenderness of nearby gums and also the discoloration of the tooth. There are times when there are no symptoms. Having a damaged nerve in the tooth alone does not suggest that a root canal is necessary. The nerve's only function is sensory - determining hot or cold. However, when the pulp and the nerve tissue become damaged, it breaks down and this causes bacteria to form in the pulp chamber. This can lead to one getting an abscessed tooth, and can eventually lead to swelling around the face and neck and severe toothache. During the root canal procedure, the infected or damaged pulp if the tooth is removed. The empty space is then cleaned, filled and sealed. Usually a crown is put on to protect the underlying tooth which is made more susceptible to fracture due to the loss of a great amount of the tooth structure from the decay. Even though the root canal treatment often takes one to two visits, there are times when more visits are necessary due the complexity of the tooth and the cause of the root canal. In preparation for the procedure an x-ray is taken of the tooth, and then it is examined. A local anesthetic is used to eliminate or reduce any pain that may occur during the procedure. After the spaced has been cleaned and shaped a temporary filling made of biocompatible material is placed in the space. This material created a barrier to prevent fluids and other matter from entering the tooth at the tip of the root. After the root canal procedure is completed and the temporary filling removed, if the tooth lacks sufficient structure to hold a restoration in place, a post will need to be made inside the tooth. This will help provide a solid foundation for a crown or other restoration and will protect and restore the tooth to its full function.